I love those little moments. The ones where you stumble upon your child playing quietly and creating a world that is uniquely theirs. This was caught on Saturday - one of her favorite things to do is to "make a village" where her animals, princesses, little people, and other characters all co-exist in a lego filled utopia. Sometimes I wish I could be one of those little plastic people and live in the world she creates, even for only a few minutes. It'd be magical, I just know it. The big kid, aka, Felicia, gets on baking tears sometimes. Last week, she was rippin' up some cakes and cupcakes, and by ripping up, I mean she made 2 batches of cupcakes in one night and made a cake for a friend at school the next night. She's taking family and consumer sciences (otherwise known as Home Ec) as an elective, and her teacher told her to make something for some extra points. So she came home, pulled out Betty Crocker and invented her version of rainbow cupcakes. Now, I've seen pictures of rainbow cupcakes, but I've never seen how one goes about making them. I've been too lazy to look it up, but her version came out so bright and colorful that I wouldn't dream of trying it another way. Take the butter out of the fridge to soften and preheat the oven to 350°F. Prepare one 9x13 pan or two 9-inch round pans by greasing them thoroughly with butter or non-hydrogenated vegetable shortening. You can also flour them, if you want, although this isn't strictly necessary. Sprinkle a little flour over them, tilt and shake to distribute evenly, then tap out the excess over the sink. In Felicia's case, she just made cupcakes so she got to skip all of the above by just placing liners in the pan. Mix the ingredients together in the order they're listed - creaming the softened butter and sugar first, then adding the eggs, flour, salt, baking powder, and finally the liquids. Using an electric beater, beat everything together on low for 30 seconds, then high for 3 minutes. If you don't want rainbow cupcakes, then proceed to the pour and bake section below. If you do, then follow along here. Divide the batter evenly into 6 bowls. Choose your 6 rainbow colors. Felicia used gel food coloring, as we've found it offers the brightest colors. Mix one color into each bowl until the batter has the vibrancy you are looking for. Once you have your colors mixed, take a ziploc sandwich bag and fill the bag with the batter - one color per bag. Once you have the batter in the bag, be sure to close the top and then snip a corner of the bag for easy squirting. Make a quick squirt in each cup. It doesn't have to be precise or even. In fact, the more uneven you layer your colors in, the cooler your cupcakes look when baked. Continue this process for all six colors. Once you have all of your colors added to your cupcakes/cake, you are ready to bake. [POUR AND BAKE SECTION] Immediately pour into the prepared pans and bake for 25-30 minutes, or until the tops spring back slightly when pressed. (CAKE INSTRUCTIONS ONLY) Let cool on wire racks for at least 15 minutes, then flip each pan over onto the rack and tap gently all over. Lift the pan slightly. If the cake doesn't feel like it's falling out smoothly, lay a slightly damp kitchen towel over the pan and tap again. If necessary, let the cakes cool more. If they have been baked thoroughly, however, they should fall right out of the pans once they've cooled a little and the sides of the cake have shrunk back from the pan. After the cupcakes cool, frost/decorate as desired. Felicia experimented with frosting, and she chose to top these off with some butter cream frosting with a few sprinkles on top. These were so cute and good - too bad we forgot to take a picture of the inside - just another reason to make them again soon! Good news! A few weeks ago, I finally finished up our Halloween scrapbook. Bad news...it was from 2009. Oh well, at least it's done. Em LOVES looking through it. It even inspired her to start her own scrapbook. She still seems surprised when I'm able to go to a random drawer, box or shelf and pull together whatever materials I need to suit her creative whim. She asked for a scrapbook, and I produced a mini book. She chose some paper, we cut it together and completed 2 pages. She's been asking every day to do more, but with our schedule, it will likely have to wait for the weekend. Back to Halloween...here are a few shots of how it turned out. I'll likely re-shoot some of these with the pages out of the sleeves, but I was too lazy to deal with all of that. The book is 8" x 8" and I used a bit of ribbon across the front and the Halloween canvas sticker. I can't remember the manufacturer. One of the first inside pages - Heather and I. I actually did this page last October and it was one of the first pages I completed after my multi-year hiatus. I was pretty happy with how it turned out. The paper throughout the book is either Basic Grey (2 different packs) or Recollections. The majority of the embellishments also come from the same lines. Yeah - I know. I need to take them out of the sleeve. I will next time. Promise. We had a Halloween party, and this is the opening double spread that talks about the activities. We had, I think, 7 kids all under the age of 5. We decorated cupcakes, made Halloween crafts and went trick or treating throughout the house. Everyone had a really good time. Love that this came out pretty well, despite the page protector. This is Miss Addy, the cow-girl. This is the last page of the book. The picture is only blurry because of the page protector, but I just love the way this one turned out. I had so much fun working on this project. When I finished it, I immediately started two other books, which I should have done soon. Yay! It's been a busy past week and a half around here. We were in Mississippi for Mardi Gras for 4 days and then we got home and I headed to Louisville, KY for work for 2 days. The weekend brought a 6 hour trip to the ER for me (all is fine) and catching up on all of the things that were left untouched for a week and a half. So there hasn't been a ton of time for blogging, but I at least wanted to post a few things I'm diggin' on this week. 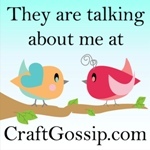 I found this via craftgossip, and there's a handy tutorial on the SmallFryandCo website. Looks pretty easy to make and I do have a few vinyl tablecloths laying around. It sure would make my lunches more stylish. One of these years, I will be organized enough to have decorations up for every holiday. As it stands now, I only manage to get the big ones. 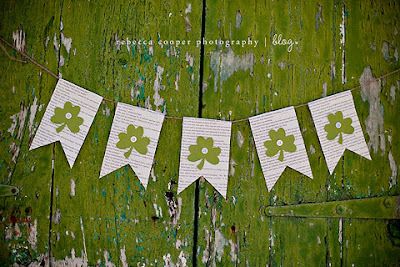 I love this idea though - so simple and easy and you could use whatever materials you had on hand to make this. Might be a fun Emily and me project. You can find more info on Rebecca Cooper's lovely blog. Have I mentioned how much I love Annie's Eats? I do. I've tried so many of her recipes and they have never disappointed. 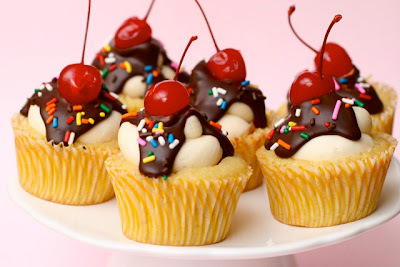 I'm in love with how darling these cupcakes look. Seriously - I mean, they are almost too cute to eat! I'm keeping this recipe on standby for the next get-together with friends. Check out the recipe here. Oh and if you haven't tried these yet - search her site for fish tacos. They are so yummy and they made it to our dinner menu again this week! One of the many amazing things that I learned about in college was Mardi Gras. My best friend in college was from New Orleans, and we went 'home' every year for the celebration. I'm a sucker for a normal parade, so you might imagine the kind of frenzy I enter into when I attend a parade that throws cheap plastic beads and cups at you. To paraphrase Hank Williams Jr., "If Heaven don't have Mardi Gras, I don't wanna go." I LOVE Mardi Gras! Love! After college, I continued the tradition of going and introduced my family and other friends to the spectacular-ness of it all. Imagine my delight when I met Heather and discovered that her family is from the gulf coast and they get into Mardi Gras too! So when Emily was born, we decided to keep the tradition of going to Mardi Gras alive, but we moved from New Orleans to Mississippi. Mississippi's parades are not as grand, but they are just as fun and the nice thing about them is that you don't have to worry about a bunch of drunk people showing off their goodies. There are lots of kids and families and it's a great way to spend a few days with friends and family you love. So that's where we'll be for the next few days. Unfortunately we we will be back home for Fat Tuesday, but I'm looking forward to a little king cake, a po' boy, catching lots of beads and yelling myself silly! Heather started a job about 5 months ago that requires her to work on the weekends. With that change, came a change in how I use my time on the weekends. I try to get some chores in, but I don't stress about it as much a I used to since I have a 3-year-old that needs my attention. I often have a 16-year-old with the same needs, so I do what I can to oblige them. This past Saturday started out with a shopping trip. We got up, and got dressed and the little person had to be like the big person and wear her sunglasses. We headed to Michael's for some new paints and a half buggy full of impulse buys later, we left the store and decided that we needed to buy some shoes. So we headed to Kohl's. Two pairs of shoes and more impulse buys (hey - we needed it AND it was on sale) later we left the store and realized that all of that shopping impulse buying made us hungry. So we headed to Panera and had some lunch. After lunch, we decided to go home and get down to business. It was a GORGEOUS day - no clouds, about 70 degrees, so we changed into 'paint clothes' and pulled out the quilt and all of our supplies to the front yard. It wasn't long before our shoes and socks came off. Then we got to work. I had a lot of flower pots left over from the baby shower I hosted a few weeks ago, and I decided that they will be great for our backyard make-over. So we each grabbed three. Emily finished hers in about 30 minutes. Felicia and I took a bit longer. Emily also painted some wooden glasses that we picked up in the dollar bin at Michael's. Have you seen the dollar bins at Michael's lately? They have great stuff - check 'em out! That's a LOT of beads for a 3-year-old! I was very impressed with her work. She started a second necklace for Grandpa, but she didn't get as far, but she informed me this morning that Grandpa doesn't like as many beads so it will be ok.
After flower pots and necklace making, the children decided to make mischief. There's still yellow paint on our walkway. I really hope it comes off. After running back and forth on the craft paper with painted feet, the girls decided that there was still one more use to be had out of the paper. We had an impromtu paper fashion show. Tim Gunn, eat your heart out. After our afternoon of fun, we went inside to knock out some chores (I do feign responsibility every now and then) and then we had homemade pizza for dinner with some friends that came over followed by a few games of Mexican Train Dominos. It was a great day and had so much fun hanging out with the girls. Can't wait for our next sunny Saturday!